Summer Dill Potato Salad was inspired by a BLT with lots of bacon and tomatoes and peas instead of lettuce for little pops of sweetness. My husband and I have reached a new chapter in child rearing. We realized it while on vacation this past week. It came as an unexpected surprise and it made us maybe just a touch sad. We are no longer cool. It was bound to happen. I just didn’t expect it at 6. Here is how it went down: the condo we stay at in Hot Springs Arkansas is always filled with kids…which is great! In past years my kids have been happy to play with these kids at the pool or playground but always came back to the room with us. But not this year! This year there was a nice family with 2 boys downstairs and a nice family with 3 girls next to us. I barely saw my kids all week. At first I was leery of them hanging out in some one else’s room, but I had little choice but to get over it. It made me nervous and anxious but being over-protective was not the route to take. The kids did so well and showed off all of those manners I have been drilling into them from day one and they learned the art of the check-in and – especially with Jack – the fish tale. Ella discovered “girl talk” and Jack practiced arm wrestling while my husband and I sat on the balcony, mentally chewing our nails and catching up on our Summer reading. Kids sneak up on you. One minute they are tiny little bundles of joy or drooling toddlers full of wonder and excitement and the next minute they are brushing you off for the 10 year old downstairs with the Nintendo 3DS. It’s quick and it stings, a bit like a band-aid, but this is just another chapter. I have already noticed we are moving into a period of consequences. Good and bad consequences. This is the important stuff they are learning here. Making decisions and how those decisions will affect them in the future. It’s not always an easy thing to teach. It’s hard watching your own child fail but it is so satisfying watching them succeed. Anyway…this is the Summer of New Stuff. We have had the Summer of Adventure and the Summer of Skint Knees already, now we are on to new things. And new things is tomatoes in potato salad. And I am a fan! So here is to Summer and childhood friends and tomatoes in potato salad and all sorts of other new things. 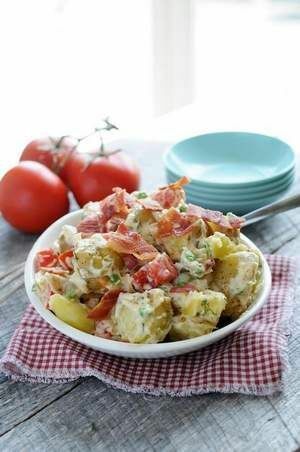 BLT inspired, this potato salad will liven up an summer party! In a large pot, cover potatoes with cold water and bring to a boil. Boil until potatoes are tender adding peas during the last few minutes to cook through. Drain and transfer to a large bowl. Add remaining ingredients and fold together until combined. Refrigerate until ready to serve. Tip: Start with a ¼ cup of mayo and add more if needed. Some people like more mayo than others. A word of warning. One day you will not only be not cool, but also not very bright. Don’t worry, within a couple years of your kids graduating you will begin to regain your intelligence, but it is a slow process. If your kids go to college, you will start getting smarter about the third year. Been there, done that, got the shirt.